Yo, ho, ho, and a bottle of rum! Oh there was a strong storm the other night so we batten down the hatches and the entire crew prepared for it. It was a long night but thankfully there were no casualties in the good old Jolly Roger. Jacob’s ladder snapped though but everything is all taken care of now. We buckos are already experienced on these kinds of things. ‘Afore me get some rest in me cabin, me won’t forget to leave ye another app review. 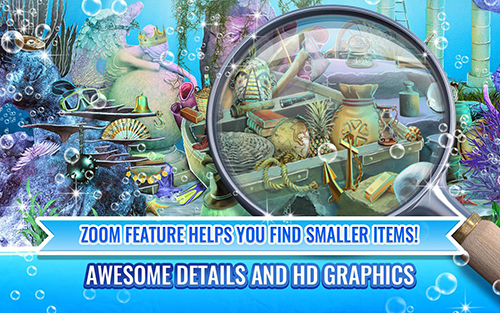 Let me share to ye lads and lasses about an app called Ocean Hidden Object Game – Treasure Hunt Adventure by Hudio Hidden Objects Studio. One of the best things about this game is its graphics. As the title might already give away, it is set under the ocean and it gives you the feel of having to treasure hunt on lost ships and sunken city. The images are made in 3D and they are detailed and gorgeous. They look real and you will have that sense that you are actually under water and you are having a treasure hunt. Moreover, the developers took it to another level when they incorporated animation in the game. Most hidden object games only have non-moving images. Also, there are sound effects when objects are found like a “meow” when a cat is found. This game offers hours of gameplay as there are thousands of objects to find. There are levels that are easy to complete and there are also challenging ones that may take you time before you find everything that you need. This gives the right balance of difficulty as you will still feel challenged but at the same time it will still not feel impossible to solve the puzzles. There are different modes available instead of just the typical hidden object game where you are given the name of the hidden objects and you find them. This may be a good or bad thing for you depending on your gaming preference. If you prefer just the plain hidden object type of game and you don’t want anything else but that, you might not like this feature. However, if you are looking for variations, then this is something that you will be happy about. Some of the other modes are match pairs, word scramble, night mode, and find the difference. This app is free to download and play although it comes with in-app purchase. It’s up to you if you wish to use the latter or not. The graphics of the game is superb and it also comes with animation and sound effects. There are several objects to find that give long playing hours. The different modes offered in the game may not be a good thing for some players, especially those who prefer just the typical hidden object gameplay. 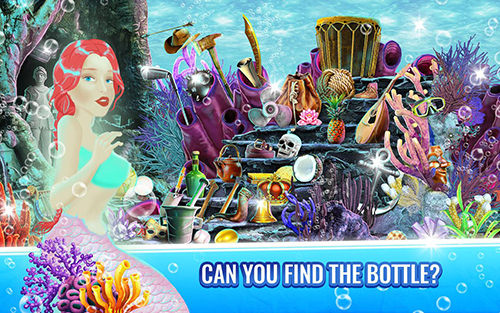 Ocean Hidden Object Game – Treasure Hunt Adventure is something to add on your list if you are into hidden object type of game. It has amazing graphics and it will give you hours of fun play as it comes with thousands of objects to find and various modes that will challenge you.